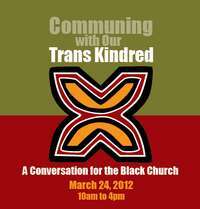 Communing With Our Trans Kindred - A Conversation for the Black Church is Saturday March 24th in Philadelphia! "I am so excited about this ground-breaking event, which creates an opportunity for African American Church communities to gain more understanding about Black transgender experiences. We know where to find transgender and LGBT activists. But for this event we need your help reaching out to folks who are not already in those circles. We need help making this Spirit filled worship opportunity known to mothers and fathers, aunts and uncles, pastors who mean well, and others who may need a helping hand on the journey to understanding. -- Could you make a personal invitation to someone you know who would benefit from this? -- Could you think of pastors, deacons, church mothers or other folks immersed in Black Church community and make sure they hear about this event? -- Could you pass this along to others who may be supportive and ask them to do likewise? -- Would you take a moment to pray for this opportunity to reach the people who are most in need of this kind of opportunity?